Pax-5 is the key regulator in B cell development. Pax-5-deficient mice show defects in B cell commitment and recombination of IgH chain gene rearrangement from DJ to VDJ. Previously, we found that Pax-5 bound to KI and KII sites, which play a crucial role in κ-chain gene rearrangement. However, the function of Pax-5 in Igκ chain gene rearrangement has not been investigated. To address this issue, we newly established pre-BI cell lines expressing the pre-B cell receptor from Pax-5-deficient mice and used them in an in vitro culture system, in which κ-chain gene rearrangement is induced by removing IL-7. By examining the Pax-5-deficient pre-BI (knockout (KO)) cells, we show in this study that, despite recombination-activating gene 1 and 2 expression, these KO cells did not rearrange the κ-chain gene following the absence of κ sterile transcription. Consistent with these data, fluorescent in situ hybridization analyses revealed that the Jκ locus in KO cells was located at the nuclear periphery as a repressive compartment. Transfection of KO cells with Pax-5 constructs indicated that the transactivation domain of Pax-5 was required for κ sterile transcription and κ-chain gene rearrangement. Moreover, the hormone-inducible system in KO cells demonstrated that Pax-5 directly functioned in κ sterile transcription. These results indicate that Pax-5 is necessary for κ sterile transcription during Igκ chain gene rearrangement. B cells in bone marrow differentiate by successive rearrangement of their IgH and -L chain genes. In the early differentiation of B lineage cells, the pre-BI cells are large cell-cycling cells that undergo spontaneous DH-JH rearrangement (1). Successful completion of VH-DHJH rearrangement is one of the checkpoints for the positive selection for B lineage cells to differentiate into large pre-B cells (2). Pre-B cells transiently bear a complex of μ-chain coupled with the surrogate L chain (Vpre-B and λ5) on their surface (2). This complex, known as pre-B cell receptor (pre-BCR)3 (3, 4, 5, 6, 7), was reported to trigger proliferation of pre-B cells (8), promote allelic exclusion at the IgH locus (9, 10), and induce differentiation to small pre-B cells, which then undergo Igκ chain gene rearrangement (11, 12). In these processes, Ig gene rearrangement and B cell development are controlled by Pax-5. Pax-5 is a member of the Pax family, which was identified on the basis of its sequence homology with Drosophila segmentation genes and is now known to consist of nine members in humans and mice (13). All Pax proteins contain a paired-box, DNA-binding domain of 128 aa located at their N-terminal end (13). Pax-5 is a singly glycosylated polypeptide with a molecular mass of 50 kDa (14). It contains the DNA-binding domain, an evolutionarily conserved octapeptide, a central region homologous to half of the paired-type homeodomain and C-terminal activating and inhibitory domains (15). Pax-5 is a transcription factor involved in early B cell development. Its expression is detected through B lymphopoiesis from the pro-B cell to mature B cell stage (16). In Pax-5-deficient mice, B cell development is completely arrested in the pre-BI cell stage, which is characterized by a large cell size as well as the surface expression of CD43 (17). Furthermore, Pax-5-deficient pre-BI cells were shown to retain a broad lymphomyeloid developmental capacity, differentiating into granulocytes, dendritic cells, macrophages, osteoclasts, NK cells, and T cells (18, 19, 20, 21). Therefore, Pax-5 is thought to function in B cell commitment by activating the transcription of B lineage-specific genes and by simultaneously repressing the transcription of B lineage-inappropriate genes. Besides its function in B cell commitment, Pax-5 is involved in Ig gene rearrangement. In Pax-5-deficient pre-BI cells, the first step of IgH gene rearrangement from germline to DHJH is normal. However, the frequency of the rearrangement from DHJH to VHDHJH is reduced to 1/50 (22). Moreover, Hesslein et al. (23) reported that Pax-5 was not required for the recombination of DHJH-proximal VH gene segments of the H chain gene, but was important for recombination of more DHJH-distal VH (J558) gene segments. In contrast to H chain gene rearrangement, few reports have focused on how Pax-5 regulates κ-chain gene rearrangement, basically because Pax-5-deficient mice have few pre-B cells due to a defect in H chain gene rearrangement (22). Moreover, most of these mice die within 3 wk after birth (17). Therefore, in previous studies, Pax-5 binding sites involved in κ-chain gene rearrangement were simply examined. Actually, we found Pax-5 binding to KI and KII sites at the Igκ locus (24). Also, Shaffer et al. (25) found Pax-5 binding to the 3′κ enhancer in the early B cell stage, and additionally observed no occupation of the Pax-5 binding site by in vivo footprinting. Because KI, KII sites, and the 3′κ enhancer element are important for κ-chain gene rearrangement (26, 27), Pax-5 is thought to function as a positive regulator in κ-chain gene rearrangement in the early stage of pre-BI cells. However, the mechanism of Pax-5 action on κ-chain gene rearrangement is not known. To overcome the abovementioned difficulties, we newly established IL-7-dependent pre-BI cell lines expressing pre-BCR from Pax-5-deficient mice. By using a previously developed in vitro culture system (28), we examined Pax-5 function in κ-chain gene rearrangement. In this system, the pre-BI cell lines were cultured in the presence of a stromal cell line and IL-7. After the removal of IL-7, the cells become smaller and undergo differentiation from pre-BI to immature B cells because of enhanced κ-chain gene rearrangement. Thus, this in vitro culture system is useful for revealing the molecular mechanisms of κ-chain gene rearrangement. In this paper, we report that Pax-5 regulates κ sterile transcription, resulting in the induction of κ-chain gene rearrangement. Therefore, we conclude that Pax-5 is essential for κ sterile transcription during Igκ chain gene rearrangement. FITC-conjugated anti-mouse CD19 (1D3), and biotin-conjugated mAbs specific for mouse CD43 (S7) and CD25 (7D4) were purchased from BD PharMingen (San Diego, CA). FITC-conjugated anti-mouse IgM (μ-chain specific) and anti-mouse Igκ chain were purchased from Southern Biotechnology Associates (Birmingham, AL). The mAb specific for mouse pre-BCR (SL156) was provided by Dr. H. Karasuyama (Tokyo Medical and Dental University), and that specific for mouse c-kit (ACK4) was provided by Dr. S. Nishikawa (Kyoto University, Kyoto, Japan). These Abs were biotin conjugated by standard methods. The mAb SL156 does not recognize a free surrogate L chain or its components, nor its complex with gp130/gp35–65. However, it binds to the surrogate L chain and H chain complex in pre-B cells (29). SFO3 (Sanko Jyunyaku, Kyoto, Japan) supplemented with 50 μM 2-ME, 2% FCS, and 0.03% primatone (w/v) was used for all cell culture experiments (referred to as SFO3 medium). Pre-B cells were cultured with mitomycin C (Kyowa Hakko, Tokyo, Japan)-treated ST2 stromal cells in SFO3 medium containing 100 U/ml IL-7 (a gift from Dr. T. Sudo (Toray, Tokyo, Japan)). For in vitro differentiation, the cells were washed with SFO3 medium to remove IL-7, and then cultured for 3 days at 5 × 105–1 × 106 cells/ml. The VDJ structure of the μH chain in Pax-5-deficient pre-B cells was determined by PCR. The common PCR primers for detection of VHJ558, VH7183, and VHQ52 families were prepared, and PCR was performed. The specific bands of VH7183 were found in the Pax-5-deficient pre-B cells. Furthermore, cells were pretreated with cycloheximide (CHX; 50 μg/ml; Sigma-Aldrich, St. Louis, MO) 2 h before adding estrogen to inhibit translation, and then treated with estradiol (1 μM; Sigma-Aldrich) to transfer a Pax-5-estrogen receptor (ER) fusion protein from the cytoplasm to the nucleus. Expression vectors pBabe-puro-bcl2, pMV10-his-bcl2, and pMV10-his-Pax-5-ER were provided by Dr. S. Nutt (Vienna Biocenter, Vienna, Austria). Mouse Pax-5, ΔCPax-5, and ΔRDPax-5 amplified by PCR were cloned into pPICT3 and sequenced. The following primers were used for amplification: 1F, 5′-GAATTCATGGATTTAGAGAAAAATTACCCG-3′; 282R, 5′-GAATTCTCACGTCAAGTTGGCTTTCATGTC-3′; and 358R, 5′-GAATTCTCACCAAGAATCATTGTAGGAAGA-3′. The mouse Pax-5, ΔCPax-5, and ΔRDPax-5 genes were cloned into EcoRI sites of the pBabe-puro or pRX-bs (30) to generate Pax-5-expressing retroviruses. Phoenix-Eco packaging cells were transfected with pBabe-puro, pMV10-his, or pRx-bs retroviral vectors by using Lipofectamine 2000 (Life Technologies, Gaithersburg, MD) according to the manufacturer’s protocol. Retroviral supernatants from stable transfectants of Phoenix-Eco packaging cells cultured at 33°C were collected at 48 h. Next, the cells were centrifuged for 40 min at 1800 rpm at room temperature in a retroviral supernatant supplemented with 8 μg/ml Lipofectamine 2000. After centrifugation, transfectants were cultured with ST2 cells in the presence of 100 U/ml IL-7, and selected with puromycin (1 μg/ml; Sigma-Aldrich), histidinol (1 mM; Sigma-Aldrich), or blasticidin S deaminase (1 μg/ml; Calbiochem, La Jolla, CA). Cells were stained and analyzed with a FACSCalibur (BD Biosciences, Mountain View, CA) as described (31). Biotinylated Abs were labeled with FITC-streptavidin. Nuclear extracts were prepared according to the method of Schreiber et al. (32). Cells (1 × 107) were harvested and washed twice in PBS, and then the cell pellet was resuspended in 400 μl of buffer A (10 mM HEPES (pH 7.5), containing 10 mM KCl, 0.1 mM EDTA, 0.1 mM EGTA, 1 mM PMSF, 2 μg/ml aprotinin, 1 mM DTT, 400 μM Na3VO4, 2.5 μg/ml leupeptin, and 5 μg/ml pepstatin). After incubation for 15 min on ice, 25 μl of 10% Nonidet P-40 was added, followed by vortexing. Next, the cells were centrifuged in a microcentrifuge at 15,000 rpm for 1 min at 4°C. The supernatants were then discarded, and the cell pellets were resuspended in 100 μl of buffer C (20 mM HEPES (pH 7.9), 25% glycerol, 0.4 M NaCl, 1 mM EDTA, 1 mM EGTA, 1 mM PMSF, 2 μg/ml aprotinin, 1 mM DTT, 400 μM Na3VO4, 2.5 μg/ml leupeptin, and 5 μg/ml pepstatin) and shaken for 15 min at 4°C. After centrifugation in a microcentrifuge at 15,000 rpm for 5 min at 4°C, the supernatant was transferred to a fresh Eppendorf tube. The protein concentration of the nuclear extracts was determined by using the Bradford assay. DNA was end-labeled with 32P by the Megalabel kit (TaKaRa Shuzo, Kyoto, Japan). EMSA was performed as described (33). Labeled DNA (1.5 × 104 cpm) was incubated with 2 μg of poly(dI:dC) (Pharmacia, Uppsala, Sweden) and nuclear extracts in a total volume of 20 μl. After incubation at room temperature for 15 min, samples were loaded onto a 5% polyacrylamide gel (29:1 acrylamide:bis-acrylamide), which was prerun for 1 h at room temperature at 150 V in 1× TAE (Tris-acetate, EDTA). Samples were electrophoresed at 150 V for 2 h. The gels were then dried and exposed to x-ray film (Kodak, Rochester, NY). Oligonucleotide pairs for CD19 promoter, 5′-CTAGACACACCCATGGTTGAGTACCCTCCAGT-3′, and Oct, 5′-GATCTGCTTCTTAATAATTTGCATACCCTCACTG-3′, were used. The Oct probe binds the ubiquitous Oct-1 factor (34). Extraction of genomic DNA and PCR amplification were performed as previously described (12). Briefly, reaction mixtures for PCR amplification consisted of 100 ng of genomic DNAs, a 200 nM concentration of each dNTP, a 500 nM concentration of each oligonucleotide, 10 mM Tris-HCl (pH 8.3) containing 50 mM KCl and 1.5 mM MgCl2, and 2.5 U of Taq polymerase (TaKaRa) in a volume of 50 μl. Reactions were cycled as follows: 28 cycles at 94°C for 30 s, 60°C for 1 min and 30 s, and 72°C for 1 min, with an increase in extension of 5 s/cycle. PCR primers used were as follows: 5′-GGCTGCAGSTTCAGTGGCAGTGGRTCWGGRAC-3′ for Vκcom; 5′-TGCCACGTCAACTGATAATGAGCCCTCTC-3′ for Jκ5; and 5′-CCAAGGACGAGTATGAACGACATAACAGCTATAC-3′ and 5′-GTGTAATCTCACGGTATAGAGGTCCTTGAAG-3′ for Cκ. PCR products were electrophoresed with 1% agarose gel and subsequently blotted onto positively charged nylon membranes (Biodyne Plus, East Hills, NY). Jκ and Cκ fragments were labeled with digoxygenin and hybridized at 42°C overnight in DIG Easy Hyb (Boehringer Mannheim, Mannheim, Germany). After the membranes had been washed, signals were detected with alkaline phosphatase-conjugated anti-digoxygenin mAbs and the chemiluminescent substrate. Probes used for Southern blotting were a 2.6-kb HindIII fragment containing Jκ1–5 for κ-chain gene rearrangement and a 2.7-kb BamHI-HindIII fragment containing Cκ as a control. Extraction of total RNA, cDNA synthesis, and PCR amplification were performed as described earlier (35). RNA (1 μg) was reverse transcribed in the supplied buffer using avian myeloblastosis virus reverse transcriptase (TaKaRa) and 0.02 μg of oligo(dT) primer. Reaction mixtures for amplification consisted of 1 μl from 50-μl cDNA mixtures, a 200 nM concentration of each dNTP, a 500 nM concentration of each oligonucleotide, 10 mM Tris-HCl (pH 8.3) containing 50 mM KCl and 1.5 mM MgCl2, and 2.5 U of Taq polymerase (TaKaRa) in a volume of 50 μl. Semiquantitative RT-PCR was performed as described (36). The experimental reverse-transcription reactions for recombination-activating gene (Rag)1, Rag2, Pax-5, and β-actin were serially diluted 5-fold. Reactions were cycled as follows: Rag1 and Rag2, 25 cycles of 94°C for 1 min, 60°C for 1 min, and 72°C for 1 min; Pax-5, 30 cycles of 94°C for 1 min, 60°C for 1 min, and 72°C for 1 min; β-actin, 22 cycles of 94°C for 1 min, 60°C for 1 min, and 72°C for 1 min; and κ sterile transcript, 28 cycles of 94°C for 20 s, 60°C for 25 s, and 72°C for 1 min and 30 s. The following PCR primers were used: for Rag1, 5′-TGCAGACATTCTAGCACTCTGG-3′ and 5′-ACATCTGCCTTCACGTCGAT-3′; for Rag2, 5′-CTTCTCTAGAGATTCCTGCTACCTCCCACC-3′ and 5′-TGTGGAATTCACTGCTGGGGTACCCAGGGG-3′; for Pax-5, 5′-GTCCCAGCTTCCAGTCACAG-3′ and 5′-AATAGGGTAGGACTGTGGGCC-3′; for β-actin, 5′-CATCGTGGGCCGCTCTAGGCACCA-3′ and 5′-CGGTTGGCCTTAGGGTTCAGGGGG-3′; for κ sterile transcript (0.8 kb), 5′-CAGTGAGGAGGGTTTTTGTACAGCCAGACAG-3′ and 5′-CTCATTCCTGTTGAAGCTCTTGACAATGGG-3′; and for CD19, 5′-AAAGGAAGCGAATGACTGACC-3′ and 5′-AAGTCCATCATCCTGCCAACT-3′. FISH was performed as described (37). Cells were seeded onto polylysine-coated slides and fixed in 4% paraformaldehyde in PBS for 10 min. They were then washed and permeabilized with 0.4% Triton X-100 in PBS for 5 min. To facilitate detection of DNA sequences by FISH, we also performed additional nuclear permeabilization steps consisting of repeated freeze-thaw in liquid nitrogen and treatment with 0.1 M HCl for 5 min. For visualization of genomic loci by FISH, cells were denatured in 70% deionized formamide and 2× SSC at 73°C for 3 min, and washed for 3 min in cold 70% ethanol before the addition of the denatured DNA probes. Hybridization was conducted at 37°C overnight, followed by washing three times at 42°C in 50% formamide/2× SSC for 5 min each time, and three times in 2× SSC for 5 min each time. The Jκ locus probes (a gift from Dr. H. Sakano (University of Tokyo, Tokyo, Japan)) were labeled with biotin by nick translation and detected by using streptavidin-FITC. Detection of nuclear proteins by anti-lamin B Abs (M-20 and C-20) (Santa Cruz Biotechnology, Santa Cruz, CA) was performed simultaneously with the FISH detection step. The nuclei were counterstained with 4,6-diamidino-2-phenylindole. The slides were examined through a Nikon Eclipse epifluorescence microscope (Nikon, Tokyo, Japan) equipped with a charge-coupled device camera (Photometrics, Tucson, AZ). Images were captured with Quips (Vysis, Downers Grove, IL) software and processed with Adobe Photoshop (Adobe Systems, Mountain View, CA). For analysis of three-dimensional (3D) immuno-FISH, a confocal microscope (LSM510; Zeiss, Oberkochen, Germany) was used. To examine Pax-5 function in κ-chain gene rearrangement, we newly established pre-BI cell lines expressing pre-BCR from Pax-5-deficient mice. One representative clonal cell line, KO, was chosen. Fig. 1⇓A shows the results of flow-cytometric analysis of KO cells cultured with IL-7 and the ST2 stromal cell line. KO cells expressed c-kit and CD43, whose expression is detected at the pre-BI cell stage. They also expressed a μ-chain, pre-BCR, and CD25. Finally, the cells failed to display CD19, which is a target gene of Pax-5, and κ-chains (Fig. 1⇓A). Absence of κ-chain expression in KO cells. A, Establishment of Pax-5-deficient pre-BI cell line (KO). KO cells were established from bone marrow cells of Pax-5-deficient mice. To increase the cell viability, we transfected KO cells with the bcl2 gene, resulting in the cell line KO-bcl2. KO and KO-bcl2 cells were cultured with IL-7 and stromal cell line ST2. B, An in vitro differentiation assay. The surface molecules of KO or KO-bcl2 cells were examined by flow cytometry (FACSCalibur; BD Biosciences). 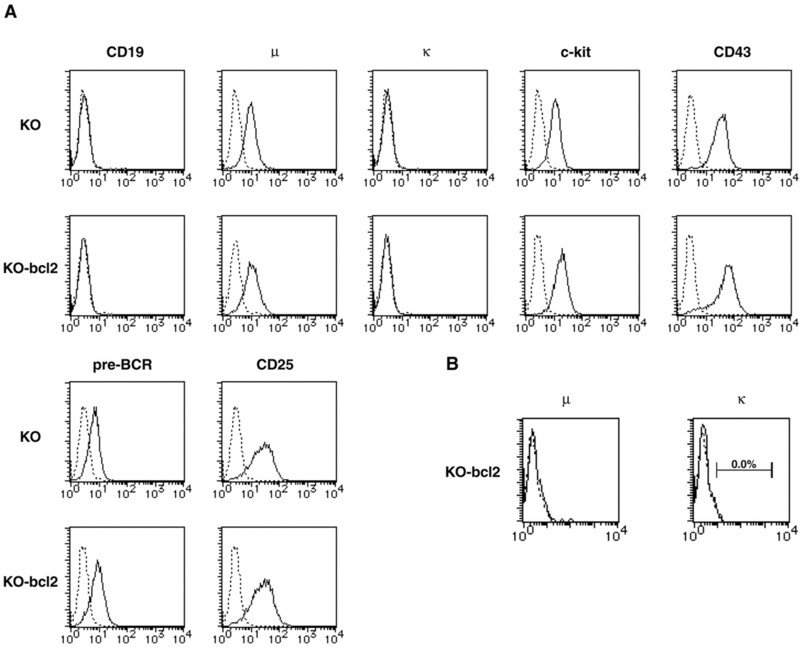 The Abs against mouse CD19 (1D3), IgM (μ-chain specific), κ-chain, c-kit (ACK4), CD43 (S7), pre-BCR (SL156), and CD25 (7D4) were used for flow cytometry. The dead cells were excluded by PI staining. The negative control (no Ab) is indicated by the dotted line. The results are representative of three independent experiments. To induce the differentiation in vitro, IL-7 is removed from pre-B cell cultures (28). Next, we examined whether a κ-chain could be detected in KO cells cultured in the absence of IL-7 for 3 days. Propidium iodide (PI) was used to exclude dead cells. Because most of KO cells rapidly died after the removal of IL-7 and were stained with PI, no κ-chain was detected. Therefore, we concluded that KO cells could not survive long enough to express a κ-chain. To increase the cell survival time, we introduced the bcl2 gene in a retroviral vector into KO cells, and established KO-bcl2 cells (Fig. 1⇑). This gene did not change the surface phenotype (CD19−, μ-chain+, κ-chain−, c-kit+, CD43+, pre-BCR+, and CD25+) in the presence of IL-7 (Fig. 1⇑A). Moreover, they also showed increased viability because of a longer cell survival after the removal of IL-7. However, neither μ-chain nor κ-chain expression could be detected in KO-bcl2 cells 3 days after the removal of IL-7 (Fig. 1⇑B). The μ-chain is thought to stay in the cytoplasm of KO cells because of its inability to form a IgM receptor complex. Actually, μ-chain expression but not κ-chain expression was confirmed by Western blotting analyses (data not shown). Thus, cell viability increased by bcl2 was insufficient for κ-chain expression in KO cells. These data are consistent with the phenotype of Pax-5-deficient mice with an overexpressed bcl2 gene (38). Because the utility of KO cells was confirmed (Fig. 1⇑), we next examined how Pax-5 is involved in κ-chain gene rearrangement at the molecular level (Fig. 2⇓). For these experiments, KO-Pax-5-bcl2 cells were established by using a vector for the expression of Pax-5. These cells were in the pre-BI cell stage, because CD43 and c-kit were expressed. First, by EMSA, we checked Pax-5 expression in KO-bcl2 and KO-Pax-5-bcl2 cells cultured with IL-7 and ST2 cells. Fig. 2⇓A shows that Pax-5 was expressed in KO-Pax-5-bcl2 but not in KO-bcl2 cells. Absence of κ-chain gene rearrangement in KO-bcl2 cells. A, Results of EMSA analysis using CD19 and Oct probes. For EMSA, nuclear proteins were obtained from KO-bcl2 and KO-Pax-5-bcl2 cells cultured in the presence of IL-7. These nuclear protein extracts contained similar amounts of the ubiquitous Oct-1 transcription factor, confirming their relative equivalence and integrity. B, Igκ rearrangement assay. Genomic DNAs were isolated from KO-bcl2 and KO-Pax-5-bcl2 cells cultured in the presence or absence of IL-7. PCR was performed to detect κ-chain gene rearrangement. Southern blot analysis was conducted to detect the rearranged bands by using Jκ or Cκ DNA fragments. To detect Pax-5 protein, we performed EMSA analysis. C, Semiquantitative RT-PCR using total RNA from KO-bcl2 and KO-Pax-5-bcl2 cells. Total RNA was extracted for cDNA synthesis from KO-bcl2 and KO-Pax-5-bcl2 cells cultured in the presence of IL-7. RT-PCR was performed to detect Rag1, Rag2, Pax-5, and β-actin transcripts. The reverse-transcription reactions for Rag1, Rag2, Pax-5, and β-actin were serially diluted 5-fold. Southern blotting analysis showed that VκJκ rearrangements were specifically induced in KO-Pax-5-bcl2 cultured in the presence or absence of IL-7 for 3 days (Fig. 2⇑B). No bands of VκJk recombination could be detected in KO-bcl2 cells even after longer exposure (data not shown), indicating that VκJk recombination was completely inhibited in the KO-bcl2 cells. In contrast, a low level of κ-chain gene rearrangements was detected in KO-Pax-5-bcl2 cells in the presence of IL-7. In other words, κ-chain gene rearrangement did not occur as a consequence of B cell differentiation. 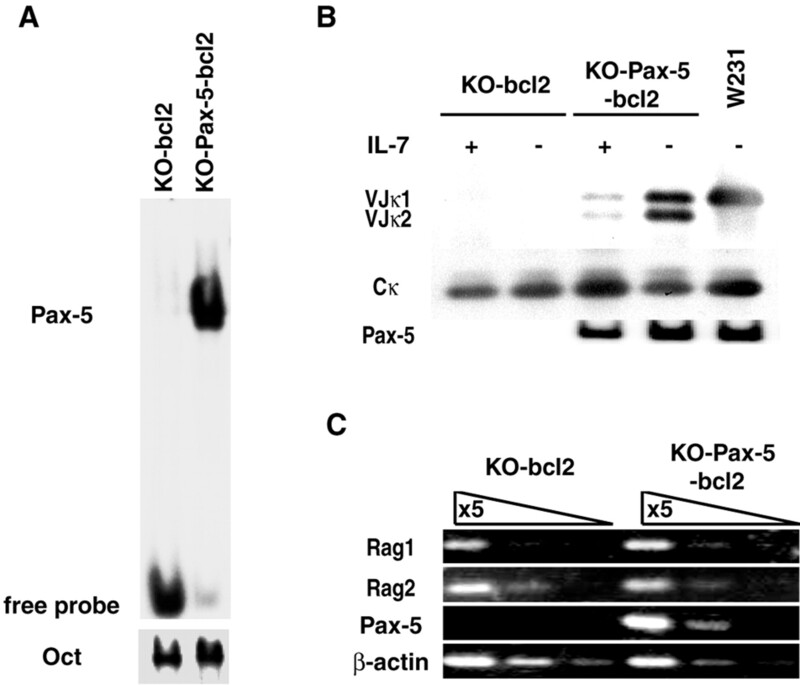 Pax-5 was expressed in KO-Pax-5-bcl2 cells in the presence and absence of IL-7, suggesting that Pax-5 specifically functions in the initial stage of κ-chain gene rearrangement. Furthermore, to investigate the mechanism of inactive κ-chain gene rearrangement in KO-bcl2 cells, we first checked Rag transcripts by conducting semiquantitative RT-PCR. The levels of Rag1 and Rag2 transcripts were approximately equal in KO-bcl2 and KO-Pax-5-bcl2 cells (Fig. 2⇑C). Pax-5 was expressed in KO-Pax-5 cells cultured in the presence of IL-7. Hence, the levels of Rag transcripts appear to be independent of Pax-5 expression in this in vitro culture system. Consistently, we detected VDJ recombination and μ-chain expression in KO-bcl2 cells (Fig. 1⇑A), indicating the recombination mechanism to be normal in KO cells. Thus, these results suggest that Pax-5 may regulate κ sterile transcription. To investigate whether Pax-5 regulates the κ sterile transcription, we performed RT-PCR. RNA was isolated from KO-bcl2, KO-Pax-5-bcl2, λ5−/− pre-BI, recombination activating gene (Rag)2−/− pre-BI, and WT pre-BI cells cultured in the presence or absence of IL-7. The λ5−/−, Rag2−/−, and WT pre-BI cell lines were established from λ5-deficient, Rag2-deficient, and wild-type mice, respectively. The differentiation stage of these cell lines was similar to that of KO cells, because CD43 and c-kit of pre-BI cell markers were similarly expressed (data not shown). It was reported previously that both λ5−/− and Rag2−/− pre-BI cells failed to differentiate into immature B cells because of their inability to undergo μ-chain recombination (39) and to form the pre-BCR complex (40). Fig. 3⇓ shows that the level of κ sterile transcripts was drastically reduced in KO-bcl2 cells, and restored in KO-Pax-5-bcl2, compared with that in λ5−/−, Rag2−/−, or WT pre-BI cells. IL-7 removal did not change the level of κ sterile transcripts in any of the cell lines. Thus, B cell differentiation appeared not to be necessary for the induction of κ sterile transcripts. This result suggests that Pax-5 regulates the κ sterile transcription in early B cell development. Absence of κ sterile transcripts in KO-bcl2 cells. RT-PCR analysis of κ sterile transcripts in KO-bcl2, KO-Pax-5-bcl2, λ5−/− pre-BI, Rag2−/− pre-BI, and WT pre-BI cells in the presence or absence of IL-7. Two recombination signal sequences are required for V(D)J recombination. They are brought into close proximity for both DNA cleavage and the subsequent joining reaction. Nuclear organization and chromatin structure may regulate the regional localization of distant recombination signal sequences (41). Recently, FISH analysis was demonstrated to reveal the subnuclear compartmentalization of Ig loci (H and L chains) during early B cell development (42). Therefore, we next performed FISH analysis to examine whether the Igκ locus in KO-bcl2 cells was positioned in the nuclear periphery, which leads to the enrichment of Sir proteins involved in gene silencing (43, 44). As shown in Fig. 4⇓, KO-bcl2 and KO-Pax-5-bcl2 cells cultured with IL-7 and ST2 cells were examined by 2D and 3D immuno-FISH analyses. The mouse T cell line EL-4 was used as a negative control. The 2D FISH analysis strikingly showed that ∼75% of signals indicating the Jκ locus were preferentially located at the nuclear periphery in KO-bcl2 and EL-4 cells (Fig. 4⇓, A, B, G, H, and J). In contrast, both alleles of the Jκ loci were centrally disposed in KO-Pax-5-bcl2 cells (Fig. 4⇓, D, E, and J). To confirm the 2D FISH results, we performed 3D immuno-FISH. Confocal analysis detected most of the Jκ signals at the nuclear membrane in KO-bcl2 and EL-4 cells (Fig. 4⇓, C and I). These results thus demonstrate that the Jκ locus is inaccessible and transcriptionally silent in KO-bcl2 cells. Thus, our data suggest that Pax-5 regulates the κ sterile transcription by regulating the chromatin structure of the Jκ locus. 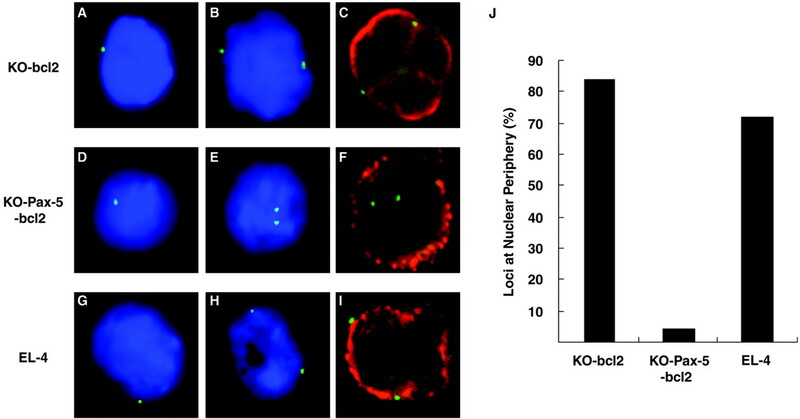 Enrichment of the Jκ locus at the nuclear periphery in KO-bcl2 cells. KO-bcl2 (A, B, and C), KO-Pax-5-bcl2 (D, E, and F), and mouse T cell line EL-4 (G, H, and I) cells were cultured in the presence of IL-7. 2D (A, B, D, E, G, and H) and 3D immuno (C, F, and I)-FISH analyses were performed with the probe for the Jκ region. The green signals correspond to the Jκ probe, and the nuclei and nuclear lamina were stained with 4,6-diamidino-2-phenylindole (blue) and anti-lamin B Abs (red), respectively. J, Signals of 2D FISH analyses were scored for the peripheral localization. Signals located at a radial distance of ≥0.95 in relation to the nuclear periphery were counted. To determine the domains of Pax-5 required for the κ sterile transcription, we constructed Pax-5 mutants. Fig. 5⇓A shows ΔCPax-5, in which the transactivation and repressor domains of Pax-5 were deleted, and ΔRDPax-5, in which the repressor domain of Pax-5 was deleted. These constructs were subcloned into the retroviral vector pRX-bs, which was used to introduce them into KO cells to establish KO-ΔCPax-5 and KO-ΔRDPax-5 cells. These cells were in the pre-BI cell stage, because CD43 and c-kit of pre-BI cell makers were similarly expressed (data not shown). To check Pax-5 expression in four stable transfectants cultured in the presence of IL-7, we performed EMSA. As shown in Fig. 5⇓B, all of these Pax-5 forms were detected. The two truncated forms of Pax-5 retained DNA-binding ability (Fig. 5⇓B). However, CD19 expression was not detected in KO-ΔCPax-5 cells. These results indicate that ΔCPax-5 did not have functional activity (Fig. 5⇓C). Transactivation domain of Pax-5 required for κ sterile transcripts. A, Diagrams of the intact and truncated forms of Pax-5. Paired domain (PD), octapeptide (Ot), partial homeodomain (HD), transactivation domain (TD), and repressor domain (RD) are indicated. B, EMSA analysis. Nuclear proteins from four stable transfectants cultured in the presence of IL-7 were analyzed by EMSA, as described in Fig. 2⇑A. C, Flow-cytometric analyses were performed in stable transfectants cultured in the absence of IL-7 by using Abs against CD19 and κ-chain, as described in Fig. 1⇑. The results are the representative of three independent experiments. D, RT-PCR analysis of CD19 and β-actin was conducted on stable transfectants cultured in the presence of IL-7, as described in Fig. 2⇑C. We introduced the bcl2 gene in the retroviral vector pBabe-puro into the four transfectants and established KO-mock-bcl2, KO-ΔCPax-5-bcl2, KO-ΔRDPax-5-bcl2, and KO-Pax-5-bcl2 cells. To test their ability to rearrange a κ-chain, we cultured them in the absence of IL-7 for 3 days. Flow-cytometric analyses showed that κ-chains were expressed in KO-ΔRDPax-5-bcl2 and KO-Pax-5-bcl2, but not in KO-mock-bcl2 and KO-ΔCPax-5-bcl2 cells (Fig. 5⇑C). The percentage of cells expressing κ-chains was ∼10%. In addition, we examined the κ sterile transcription in these stable transfectants cultured in the presence of IL-7. The levels of κ sterile transcripts were measured by RT-PCR. The data obtained indicated that κ sterile transcripts were detected in KO-ΔRDPax-5-bcl2 and KO-Pax-5-bcl2 cells (Fig. 5⇑D). Therefore, KO-ΔRDPax-5-bcl2 and KO-Pax-5-bcl2 cells retained the ability to rearrange the κ-chain gene. Thus, these results indicate that the transactivation domain of Pax-5 plays an important role in regulating the κ sterile transcription. Next, we also investigated whether the κ sterile transcription was directly regulated by Pax-5. A posttranslational induction system based on the hormone-inducible Pax-5-ER fusion protein was used for this purpose. Typically, the addition of estradiol causes the translocation of this fusion protein as a transcription factor from the cytoplasm to the nucleus. As shown in Fig. 6⇓, KO cells expressing the Pax-5-ER fusion protein (KO-Pax-5-ER) were established. Flow-cytometric analysis showed that KO-Pax-5-ER cells retained the pre-BI cell phenotype. Moreover, the treatment with estradiol but not with ethanol for 24 h induced CD19 expression in KO-Pax-5-ER cells (Fig. 6⇓A). This result suggests that the Pax-5-ER fusion protein was located in the cytoplasm in the absence of estradiol. Direct regulation of κ sterile transcription by Pax-5. A, Flow-cytometric analysis was performed on KO-Pax-5-ER cells treated for 24 h with ethanol (as the control) or estradiol (1 μM) in the presence of IL-7 to detect CD19 expression. The dotted line indicates no Ab. B, RT-PCR analysis of κ sterile transcripts, CD19, and β-actin. Expression of the indicated transcripts was analyzed by using RNA from KO-Pax-5-ER cells with estradiol (1 μM) for 6 h. For inhibition of translation, cells were grown in the presence of CHX. Finally, we examined whether Pax-5 translocation to the nucleus would cause the induction of κ sterile transcription. KO-Pax-5-ER cells were treated with estradiol for 6 h in the presence of CHX to inhibit translation. As a result, RT-PCR analysis revealed that not only CD19 but also κ sterile transcripts were detected in KO-Pax-5-ER cells treated with estradiol for 6 h even in the presence of CHX (Fig. 6⇑B). Therefore, these data demonstrate that κ sterile transcription was directly regulated by Pax-5. Pax-5 is the key regulator in B cell development. Evidence has been accumulated to indicate Pax-5 function in B cell commitment and H chain gene rearrangement. However, Pax-5 function in κ-chain gene rearrangement has not been investigated until now. The results of the present study show that Pax-5 is essential for κ sterile transcription during κ-chain gene rearrangement. We newly established pre-BI cell lines expressing pre-BCR from Pax-5-deficient mice. Pre-B cells expressing pre-BCR are suitable for investigation of the mechanism of κ-chain gene rearrangement, because H chain gene rearrangement has been already finished in that stage. By characterizing Pax-5-deficient pre-BI cell lines, we demonstrated that 1) κ-chain gene rearrangement was absent, 2) germline κ transcription was absent, and 3) the Igκ loci were preferentially located at the nuclear periphery. Moreover, we showed by the transfection with Pax-5 constructs that Pax-5 directly regulated the κ sterile transcription. Thus, our results suggest that Pax-5 is required for κ sterile transcription and κ-chain gene rearrangement in the early B cell stage. We also investigated other molecules involved in the regulation of κ sterile transcription aside from Pax-5. Recently, it was reported that activated Ras signaling caused the differentiation of both Ras-overexpressing Rag1 and JH-deficient mice into immature B cells following κ-chain gene rearrangement (45, 46). Therefore, we introduced the constitutive active form of Ras, Ras V12, into KO cells, resulting in the establishment of the cell line KO-Ras V12. However, despite Ras V12 expression, κ sterile transcripts were not induced in KO-Ras V12 cells 3 days after the removal of IL-7 (data not shown), suggesting that due to the absence of the molecules involved in pre-BCR signaling, κ sterile transcription and κ-chain gene rearrangement were not induced in KO-Ras V12 cells. Consistent with this suggestion, Igα and B cell linker protein (BLNK), regulating pre-BCR and BCR signaling, were reported to be targets of Pax-5 (47, 48, 49). Mice deficient in the cytoplasmic tails of Igα or BLNK displayed a characteristic loss of immature B, mature B, and recirculating B cells in their bone marrow and spleen (50, 51, 52, 53, 54). Therefore, it is likely that the combined loss of Igα and BLNK expression was responsible for the reduced κ-chain gene rearrangement in our Pax-5-deficient pre-BI cell lines. Although we checked both Igα and BLNK expression, these molecules were unexpectedly expressed in KO-Ras V12 cells (data not shown). Therefore, we conclude that pre-BCR signaling in KO cells is not involved in the κ sterile transcription. How does Pax-5 directly regulate κ sterile transcription? The Pax-5 binding sites involved in κ sterile transcription are still unclear. Pax-5 can bind to KI, KII, and 3′κ enhancer sites, and this binding is necessary for κ-chain gene rearrangement (26, 27). Especially, because the KII site is the promoter of κ sterile transcripts, KII and 3′κ enhancer sites may be cis-elements for κ sterile transcription. Furthermore, the data shown in Fig. 4⇑ suggest that Pax-5 regulates the chromatin structure of Jκ locus. Therefore, to regulate the κ sterile transcription, Pax-5 may require other chromatin remodeling factors that can interrupt the mononucleosome, the smallest unit of chromatin structure. Finally, we demonstrated in this study that Pax-5 regulated the κ sterile transcription in the early B cell stage. It was earlier revealed by FISH analysis that the subnuclear compartmentalization of Ig loci (H and L chains) is controlled during B cell development (42). Consistently, in IL-7R-deficient pre-BI cells, but not in λ5- and Rag2-deficient ones, the Vκ locus was reported to be located at the nuclear periphery (42). These data obtained from IL-7R-deficient pre-BI cells are quite similar to our FISH data obtained from Pax-5-deficient pre-BI cells. Thus, we suggest that Pax-5 regulates the nuclear organization and chromatin structure during Igκ chain gene rearrangement. Until now, no data had been obtained to indicate which factors are involved in the regulation of κ sterile transcription, although the downstream molecules of IL-7 signaling were earlier implicated in the regulation of the germline transcription of Vκ locus (42). Therefore, our results described here, obtained from an in vitro culture system, are the first to demonstrate that Pax-5 is essential for κ sterile transcription during Igκ chain gene rearrangement. We thank Dr. M. Busslinger for providing Pax-5 KO bulk pre-BI cells; Dr. H. Karasuyama for anti-pre-BCR Ab (SL156); Dr. S. Nishikawa for anti-c-kit Ab (ACK4); Dr. T. Sudo for IL-7-producing cells (L929 transfectant); Dr. S. L. Nutt for retrovirus vectors pBabe-puro-bcl2, pMV10-his-bcl2, and pMV10-his-Pax-5-ER; and Dr. H. Sakano for the pMM222 plasmid containing the Jκ fragment. We also thank Mr. F. Ishidate for excellent technical advice on the use of the confocal microscope, and Drs. P. Burrows and M. Busslinger for critical reading of the manuscript. ↵1 This work was supported by a grant-in-aid for scientific research from the Japan Ministry of Education, Culture, Sports, and Technology of Japan. ↵3 Abbreviations used in this paper: pre-BCR, pre-B cell receptor; CHX, cycloheximide; ER, estrogen receptor; Rag, recombination-activating gene; FISH, fluorescent in situ hybridization; 3D, three-dimensional; KO, knockout; PI, propidium iodide; BLNK, B cell linker protein. Hardy, R. R., C. E. Carmack, S. A. Shinton, J. D. Kemp, K. Hayakawa. 1991. Resolution and characterization of pro-B and pre-pro-B cell stages in normal mouse bone marrow. J. Exp. Med. 173:1213. Melchers, F., H. Karasuyama, D. Haasner, S. Bauer, A. Kudo, N. Sakaguchi, B. Jameson, A. Rolink. 1993. The surrogate light chain in B-cell development. Immunol. Today 14:60. Kudo, A., F. Melchers. 1987. A second gene, Vpre-B in the λ5 locus of the mouse, which appears to be selectively expressed in pre-B lymphocytes. EMBO J. 6:2267. Kudo, A., N. Sakaguchi, F. Melchers. 1987. Organization of the murine Ig-related λ5 gene transcribed selectively in pre-B lymphocytes. EMBO J. 6:103. Sakaguchi, N., F. Melchers. 1986. λ5, a new light-chain-related locus selectively expressed in pre-B lymphocytes. Nature 324:579. Hollis, G. F., R. J. Evans, J. M. Stafford-Hollis, S. J. Korsmeyer, J. P. McKearn. 1989. Immunoglobulin λ light-chain-related genes 14.1 and 16.1 are expressed in pre-B cells and may encode the human immunoglobulin ω light-chain protein. Proc. Natl. Acad. Sci. USA 86:5552. Bauer, S. R., A. Kudo, F. Melchers. 1988. Structure and pre-B lymphocyte restricted expression of the Vpre-B in humans and conservation of its structure in other mammalian species. EMBO J. 7:111. Karasuyama, H., A. Rolink, Y. Shinkai, F. Young, F. W. Alt, F. Melchers. 1994. The expression of Vpre-B/λ5 surrogate light chain in early bone marrow precursor B cells of normal and B cell-deficient mutant mice. Cell 77:133. Loffert, D., A. Ehlich, W. Muller, K. Rajewsky. 1996. Surrogate light chain expression is required to establish immunoglobulin heavy chain allelic exclusion during early B cell development. Immunity 4:133.
ten Boekel, E., F. Melchers, A. G. Rolink. 1998. Precursor B cells showing H chain allelic inclusion display allelic exclusion at the level of pre-B cell receptor surface expression. Immunity 8:199. Tsubata, T., R. Tsubata, M. Reth. 1992. Crosslinking of the cell surface immunoglobulin (μ-surrogate light chains complex) on pre-B cells induces activation of V gene rearrangements at the immunoglobulin κ locus. Int. Immunol. 4:637. Miyazaki, T., I. Kato, S. Takeshita, H. Karasuyama, A. Kudo. 1999. λ5 is required for rearrangement of the Igκ light chain gene in pro-B cell lines. Int. Immunol. 11:1195. Gruss, P., C. Walther. 1992. Pax in development. Cell 69:719. Barberis, A., K. Widenhorn, L. Vitelli, M. Busslinger. 1990. A novel B-cell lineage-specific transcription factor present at early but not late stages of differentiation. Genes Dev. 4:849. Dorfler, P., M. Busslinger. 1996. C-terminal activating and inhibitory domains determine the transactivation potential of BSAP (Pax-5), Pax-2 and Pax-8. EMBO J. 15:1971. Adams, B., P. Dorfler, A. Aguzzi, Z. Kozmik, P. Urbanek, I. Maurer-Fogy, M. Busslinger. 1992. Pax-5 encodes the transcription factor BSAP and is expressed in B lymphocytes, the developing CNS, and adult testis. Genes Dev. 6:1589. Urbanek, P., Z. Q. Wang, I. Fetka, E. F. Wagner, M. Busslinger. 1994. Complete block of early B cell differentiation and altered patterning of the posterior midbrain in mice lacking Pax5/BSAP. Cell 79:901. Nutt, S. L., B. Heavey, A. G. Rolink, M. Busslinger. 1999. Commitment to the B-lymphoid lineage depends on the transcription factor Pax5. Nature 401:556. Rolink, A. G., S. L. Nutt, F. Melchers, M. Busslinger. 1999. Long-term in vivo reconstitution of T-cell development by Pax5-deficient B-cell progenitors. Nature 401:603. Schaniel, C., M. Gottar, E. Roosnek, F. Melchers, A. G. Rolink. 2002. Extensive in vivo self-renewal, long-term reconstitution capacity, and hematopoietic multipotency of Pax5-deficient precursor B-cell clones. Blood 99:2760. Schaniel, C., L. Bruno, F. Melchers, A. G. Rolink. 2002. Multiple hematopoietic cell lineages develop in vivo from transplanted Pax5-deficient pre-B I-cell clones. Blood 99:472. Nutt, S. L., P. Urbanek, A. Rolink, M. Busslinger. 1997. Essential functions of Pax5 (BSAP) in pro-B cell development: difference between fetal and adult B lymphopoiesis and reduced V-to-DJ recombination at the IgH locus. Genes Dev. 11:476. Hesslein, D. G., D. L. Pflugh, D. Chowdhury, A. L. Bothwell, R. Sen, D. G. Schatz. 2003. Pax5 is required for recombination of transcribed, acetylated, 5′ IgH V gene segments. Genes Dev. 17:37. Tian, J., T. Okabe, T. Miyazaki, S. Takeshita, A. Kudo. 1997. Pax-5 is identical to EBB-1/KLP and binds to the Vpre-B and λ5 promoters as well as the KI and KII sites upstream of the Jκ genes. Eur. J. Immunol. 27:750. Shaffer, A. L., A. Peng, M. S. Schlissel. 1997. In vivo occupancy of the κ light chain enhancers in primary pro- and pre-B cells: a model for κ locus activation. Immunity 6:131. Ferradini, L., H. Gu, A. De Smet, K. Rajewsky, C. A. Reynaud, J. C. Weill. 1996. Rearrangement-enhancing element upstream of the mouse immunoglobulin κ chain J cluster. Science 271:1416. Gorman, J. R., N. van der Stoep, R. Monroe, M. Cogne, L. Davidson, F. W. Alt. 1996. The Igκ enhancer influences the ratio of Igκ versus Igλ B lymphocytes. Immunity 5:241. Kato, I., T. Miyazaki, T. Nakamura, A. Kudo. 2000. Inducible differentiation and apoptosis of the pre-B cell receptor-positive pre-B cell line. Int. Immunol. 12:325. Winkler, T. H., A. Rolink, F. Melchers, H. Karasuyama. 1995. Precursor B cells of mouse bone marrow express two different complexes with the surrogate light chain on the surface. Eur. J. Immunol. 25:446. Wakimoto, H., Y. Yoshida, M. Aoyagi, K. Hirakawa, H. Hamada. 1997. Efficient retrovirus-mediated cytokine-gene transduction of primary-cultured human glioma cells for tumor vaccination therapy. Jpn. J. Cancer Res. 88:296. Rolink, A., H. Karasuyama, U. Grawunder, D. Haasner, A. Kudo, F. Melchers. 1993. B cell development in mice with a defective λ5 gene. Eur. J. Immunol. 23:1284. Schreiber, E., P. Matthias, M. M. Muller, W. Schaffner. 1989. Rapid detection of octamer binding proteins with “mini-extracts,” prepared from a small number of cells. Nucleic Acids Res. 17:6419. Sato, H., D. Wang, A. Kudo. 2001. Dissociation of Pax-5 from KI and KII sites during κ-chain gene rearrangement correlates with its association with the underphosphorylated form of retinoblastoma. J. Immunol. 166:6704. Sigvardsson, M., M. O’Riordan, R. Grosschedl. 1997. EBF and E47 collaborate to induce expression of the endogenous immunoglobulin surrogate light chain genes. Immunity 7:25. Takeshita, S., S. Arai, A. Kudo. 2001. Identification and characterization of mouse bone marrow stromal cell lines immortalized by temperature-sensitive SV40 T antigen: supportive activity for osteoclast differentiation. Bone 29:236. Engel, H., A. Rolink, S. Weiss. 1999. B cells are programmed to activate κ and λ for rearrangement at consecutive developmental stages. Eur. J. Immunol. 29:2167. Shiels, C., S. A. Islam, R. Vatcheva, P. Sasieni, M. J. Sternberg, P. S. Freemont, D. Sheer. 2001. PML bodies associate specifically with the MHC gene cluster in interphase nuclei. J. Cell Sci. 114:3705. Thevenin, C., S. L. Nutt, M. Busslinger. 1998. Early function of Pax5 (BSAP) before the pre-B cell receptor stage of B lymphopoiesis. J. Exp. Med. 188:735. Shinkai, Y., G. Rathbun, K. P. Lam, E. M. Oltz, V. Stewart, M. Mendelsohn, J. Charron, M. Datta, F. Young, A. M. Stall, et al 1992. RAG-2-deficient mice lack mature lymphocytes owing to inability to initiate V(D)J rearrangement. Cell 68:855. Kitamura, D., A. Kudo, S. Schaal, W. Muller, F. Melchers, K. Rajewsky. 1992. A critical role of λ5 protein in B cell development. Cell 69:823. Hesslein, D. G., D. G. Schatz. 2001. Factors and forces controlling V(D)J recombination. Adv. Immunol. 78:169. Kosak, S. T., J. A. Skok, K. L. Medina, R. Riblet, M. M. Le Beau, A. G. Fisher, H. Singh. 2002. Subnuclear compartmentalization of immunoglobulin loci during lymphocyte development. Science 296:158. Andrulis, E. D., A. M. Neiman, D. C. Zappulla, R. Sternglanz. 1998. Perinuclear localization of chromatin facilitates transcriptional silencing. Nature 394:592. Cockell, M., S. M. Gasser. 1999. Nuclear compartments and gene regulation. Curr. Opin. Genet. Dev. 9:199. Shaw, A. C., W. Swat, R. Ferrini, L. Davidson, F. W. Alt. 1999. Activated Ras signals developmental progression of recombinase-activating gene (RAG)-deficient pro-B lymphocytes. J. Exp. Med. 189:123. Shaw, A. C., W. Swat, L. Davidson, F. W. Alt. 1999. Induction of Ig light chain gene rearrangement in heavy chain-deficient B cells by activated Ras. Proc. Natl. Acad. Sci. USA 96:2239. Nutt, S. L., A. M. Morrison, P. Dorfler, A. Rolink, M. Busslinger. 1998. Identification of BSAP (Pax-5) target genes in early B-cell development by loss- and gain-of-function experiments. EMBO J. 17:2319. Morrison, A. M., S. L. Nutt, C. Thevenin, A. Rolink, M. Busslinger. 1998. Loss- and gain-of-function mutations reveal an important role of BSAP (Pax-5) at the start and end of B cell differentiation. Semin. Immunol. 10:133. Horcher, M., A. Souabni, M. Busslinger. 2001. Pax5/BSAP maintains the identity of B cells in late B lymphopoiesis. Immunity 14:779. Torres, R. M., H. Flaswinkel, M. Reth, K. Rajewsky. 1996. Aberrant B cell development and immune response in mice with a compromised BCR complex. Science 272:1804. Kraus, M., L. I. Pao, A. Reichlin, Y. Hu, B. Canono, J. C. Cambier, M. C. Nussenzweig, K. Rajewsky. 2001. Interference with immunoglobulin (Ig)α immunoreceptor tyrosine-based activation motif (ITAM) phosphorylation modulates or blocks B cell development, depending on the availability of an Igβ cytoplasmic tail. J. Exp. Med. 194:455. Jumaa, H., B. Wollscheid, M. Mitterer, J. Wienands, M. Reth, P. J. Nielsen. 1999. Abnormal development and function of B lymphocytes in mice deficient for the signaling adaptor protein SLP-65. Immunity 11:547. Pappu, R., A. M. Cheng, B. Li, Q. Gong, C. Chiu, N. Griffin, M. White, B. P. Sleckman, A. C. Chan. 1999. Requirement for B cell linker protein (BLNK) in B cell development. Science 286:1949. Hayashi, K., R. Nittono, N. Okamoto, S. Tsuji, Y. Hara, R. Goitsuka, D. Kitamura. 2000. The B cell-restricted adaptor BASH is required for normal development and antigen receptor-mediated activation of B cells. Proc. Natl. Acad. Sci. USA 97:2755.